Southwest England Southwest England U-Pick farms: Find a pick your own farm near you in Southwest England for fruit, vegetables, organic foods, pumpkins, local produce and more! Looking for a local, pick-your-own farm in Southwest England? Scroll down this page and you will see the U-Pick farms in Southwest England, sorted by county. Those that offer organic or sustainably grown produce are identified by the words "organic" and/or "sustainable" in Green, next to their name . The U-pick crops they offer follow the name of the farm. To search the page for a specific crop, use Ctrl-F (or on an ipad or Mac, use their "search on this page" function) If they have a website, the name will be in blue and underlined; click on it and it will open their website. Beware of copycat websites (such as the one that starts with "pickit" and the one that ends with ".farms"; they do not update their information, they just steal it from us once in a great while (they are plagiarists operating in Russia and China), so theirs are usually out-of-date -and often copied incorrectly! I put dates to indicate when we last received an update from each farm, and I make updates daily (each farm as their info changes). See the customer and farmer menus at the top menu bar to submit updates and corrections and help me keep each current! Sutton Hokes, Verwood. Phone: 01202 814236. Open: Please call for opening hours. Stapehill Road, Hampreston, Wimborne, Dorset, BH21 7ND. Phone: 01202-873490. Email: Click here for Trehanes contact page. Directions: Click here for directions to Trehane Nursery. Opening Hours: We are currently open Monday to Friday, 8.30am to 4.30pm. Blueberries usually are available starting in mid July, then for several weeks. For the first time we will have blueberries available under polytunnels for P.Y.O. right from the beginning of the season - so don't let a bit of rain put you off coming. WARNING! Last year huge demand meant that on two occasions during the season we had to close for a couple of days to let the fruit ripen up. So if you are coming any distance we strongly advise phoning in advance (01202 873490) to check that there is plenty of ripe fruit available. Our PYO Plantation is on the same site as the Camellia Nursery. Planted in 1965 it was one of the first UK blueberry plantings. The bushes are grown entirely naturally with no chemical fertilisers, herbicides or pesticides. We do not even have irrigation on the PYO rows which means the bushes have to send out roots searching for water and nutrients. This leads to intense flavoured fruit - rated by a leading supermarket as the finest tasting blueberries they stock all year. West Holme Farm - PYO: Strawberries, Raspberries, Blackberries, Loganberries, Blackcurrants, Redcurrants and Gooseberries. Wareham, Dorset BH20 6AQ, Phone: 01929 554716. Fax: 01929 551616. Email: enquiries@holmeforgardens.co.uk. They also have a bed and breakfast! A visitor writes on August 12, 2011: "We visited Holme Farm PYO near Wareham. It was very well signposted and laid out and they had a lot of produce, plus a well stocked garden centre, cafe and farm shop. It was a great place even if you didn't want to PYO!" Longborough,Moreton-in-Marsh, Gloucestershire, GL56 0QZ. Tel : +44 (0)1451 830469. Picker’s Hotline / Fax : +44 (0)1451 830413. Email: mail@longboroughfarmshop.com. Open: Easter to Christmas 7 days a week, Monday – Saturday 9am - 6pm, Sundays & Bank Holidays 10am - 6pm, Christmas to Easter 6 days a week, Monday – Saturday 9am – 6pm. Strawberries - Early June to Mid August. Raspberries - Beginning July to End August. 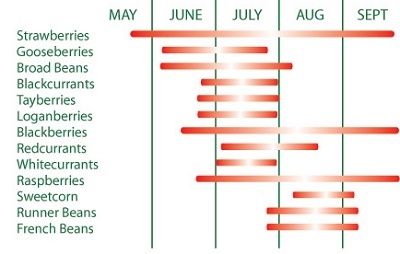 Gooseberries - Early June to End July. Redcurrants - Early June to Mid August. Blackcurrants - Early June to Mid August. Blackberries - Late July to End August. Yorcesterberries - Beginning July to Early August. Plums - Early August to End September. UPDATE, April 2016 - their website is gone; they may have been sold and gone out of business. Shurdington Road Bentham, Cheltenham, GL51 4UA. Phone: 01452 863359. Fax: 01452 864592. Email: info@primrosevale.com. Open: June to September (inclusive) Mon - Sat 9am - 6pm, Sun 10am - 5pm; (June & July Sun 9am - 6pm); October to May (inclusive) Mon - Sat 9am - 5pm, Sun 10am - 4pm. Directions: Find us off the A46 Shurdington Road, 50 yards from the A46 / A417 junction, towards Cheltenham. Not far from the M5 junction 11A, 4.5 miles from Gloucester, 3.5 miles from Cheltenahm. Click here for a map and directions. 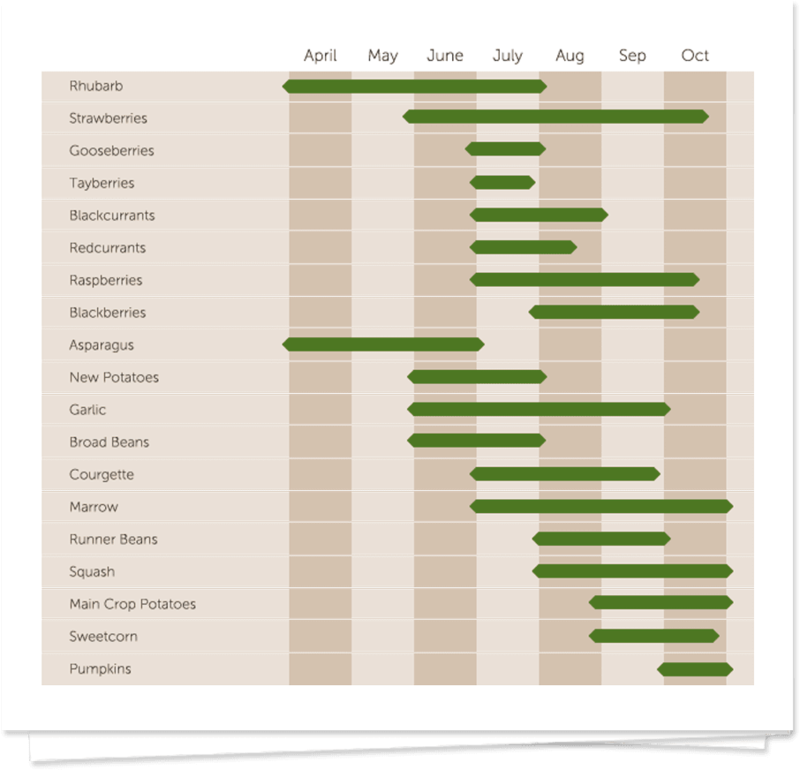 Strawberries, Raspberries, Blackberries: June - September Currants: July, Gooseberries, Broad Beans: Mid June - Mid July, Sweetcorn August - Sept. Click here for picking updates. Payment: Cash, Check, Visa/MasterCard, Debit. Farm shop open year round, selling our own and local produce, even when the picking fields are closed. Hollow Brook Lane Chew Magna, Bristol, Somerset, BS40 8TH. Phone: 01275 332397. Email: jean.phippen@yahoo.com. Directions: Follow the yellow PYO signs from Chew Valley Lake or 3rd right, 2nd left from Chelwood Bridge roundabout (junction of the A368 with the A37 at Pensford) . We are open June. Our hours are: Open 6 days a week, 9am - 7pm; closed on Monday; Strawberries - Mid June - mid August, Raspberries - July, Currants - July, Broad Beans - Late June - July, Peas - Late June - July. Loganberries - delicious juicy berries, a cross between a raspberry and a blackberry Mid June to July. Tayberries - a different cross between a raspberry and a blackberry. Mid June to July. A visitor writes on July 01, 2018: "No longer operating - when we tried the phone number on your PYO website we were told the owner retired 4 years ago!" Ansty, Salisbury, Wiltshire, UK SP3 5PX. Phone/Fax 01747 829072. Directions: Find us on the A30, 6 miles East of Shaftesbury, Dorset, or 10 miles West of Wilton, Wiltshire. Click here for the map for Ansty PYO and Farm Shop. Open: We have seasonal opening times, so before you head out, please phone to check when we are open! Click here for updated times. Mid September - December 9.30am - 5.30pm Tuesday to Saturday, 10.00am - 4.00pm Sunday. A visitor writes on June 20, 2016: "I received this email in response to mine asking if Fosseway Fruits was still trading: Dear Lesley Please be advised that Fosseway Fruits has now ceased trading and will not be open to the public. Thanku for your enquiry Kind regards C.Gooding"
Lotmead Pick Your Own - Gooseberries, strawberries, raspberries, blackcurrants, broad beans, potatoes, runner beans, sweetcorn.